The world is a canvas to your imagination. You’ll see sights beyond belief. Now imagine cruising on something extraordinary for a day or night. Where the sightseeing, dinner, and show are indescribable. Where you can enjoy things visitors have been enjoying since 1935. Where you can look up into the sky at night and hear the stars talking to you. No wonder over 18 million people from all over the world have discovered it. But then, there’s always room for one more. Paint your own canvas. 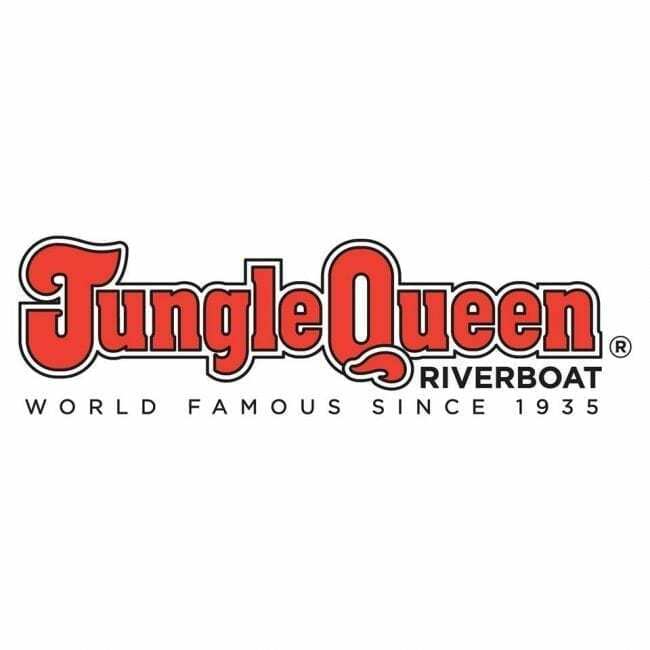 JUNGLE QUEEN, 90-MINUTE MORNING SIGHTSEEING CRUISE DEPARTS: 11am, Daily, year-round. 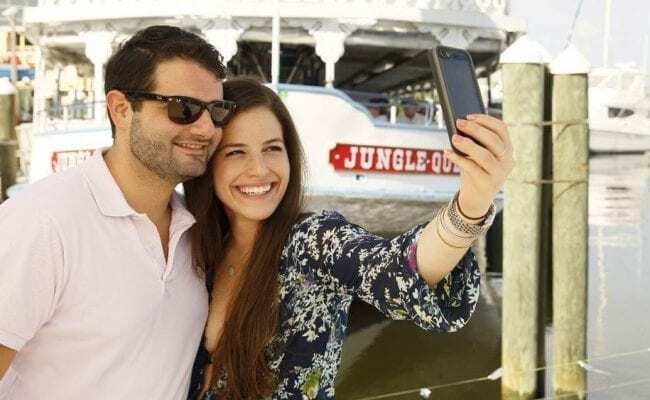 A fully narrated morning cruise down the “Venice of America,” Fort Lauderdale’s New River, sailing through Millionaire’s Row with homes of the Rich and Famous, spectacular Mega Yachts, and sights beyond belief. 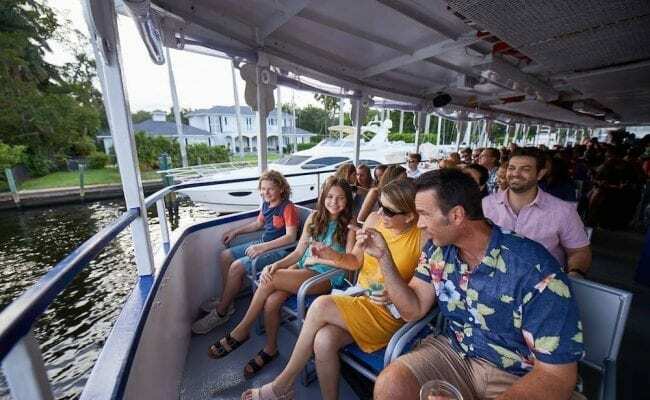 RIVER QUEEN, AFTERNOON & EVENING 90-MINUTE SIGHTSEEING CRUISES DEPARTS: 4:30 pm Thursday-Sunday, year-round & 7:00 pm, Thursday-Sunday, December thru August. A fully narrated, 90-minute morning cruise down the “Venice of America” sailing through Ft. Lauderdale’s Millionaire’s Row with homes of the Rich and Famous, spectacular Mega Yachts, and sights beyond belief. JUNGLE QUEEN, AFTERNOON SIGHTSEEING CRUISE & TROPICAL ISLE TOUR DEPARTS: 1:30pm, Daily, year-round. 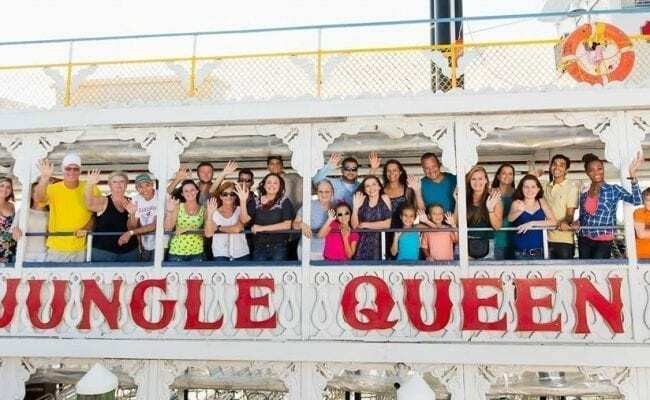 Jungle Queen’s Spectacular Afternoon Tropical Isle Sightseeing Cruise. A daily, fully narrated cruise down the “Venice of America,” Fort Lauderdale’s historic New River. See Millionaire’s Row with homes of the Rich and Famous, spectacular Mega Yachts, and sights beyond belief. 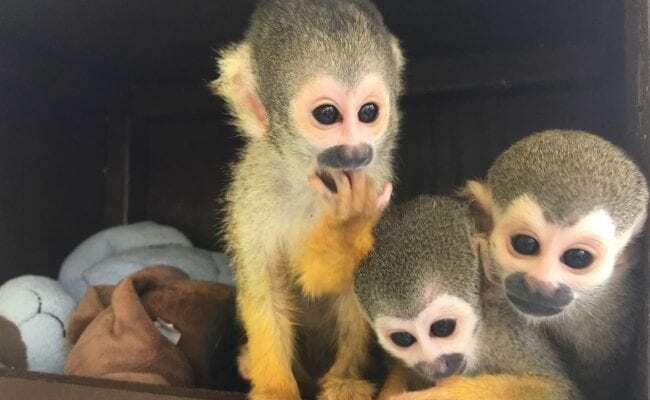 The cruise takes you to our own lush tropical isle where you can watch an alligator show, see exotic birds, lemurs and monkeys, hold a baby alligator or one of our birds, and have your picture taken with them. Hungry? Thirsty? Enjoy our extensive concession stand menu – burgers, hot dogs, chicken sandwiches, chips, ice cream, soda and much more. Don’t forget to visit our gift shop before you leave. Fully narrated cruise down the “Venice of America,” Fort Lauderdale’s New River, sailing through Millionaire’s Row with homes of the Rich and Famous, spectacular Mega Yachts, and sights beyond belief. 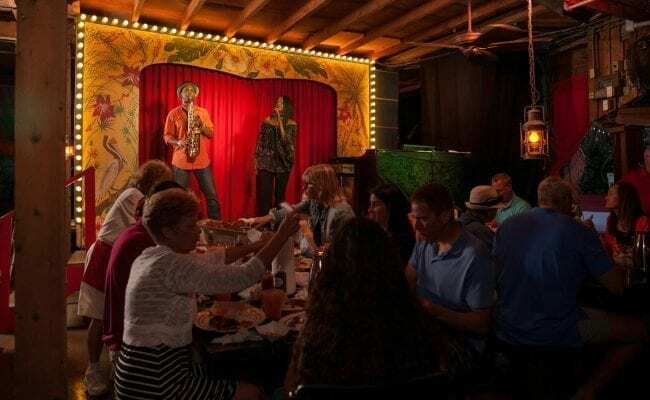 When you arrive at our tropical isle, you’ll be treated to an All-You-Can-Eat Dinner featuring barbeque baby back ribs, chicken, peel & eat shrimp and all the fixin’s. 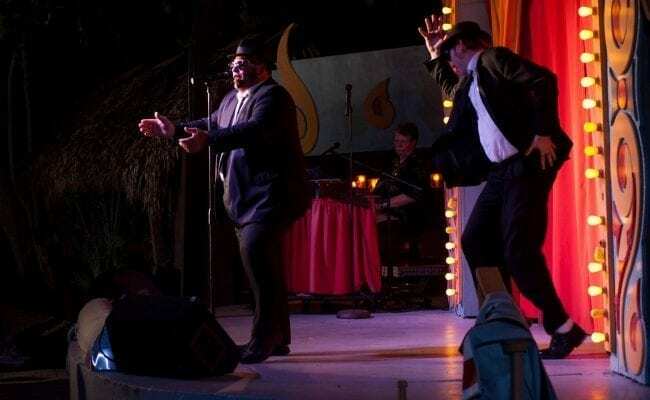 Live entertainment during dinner, and a laugh out loud variety show after dinner. 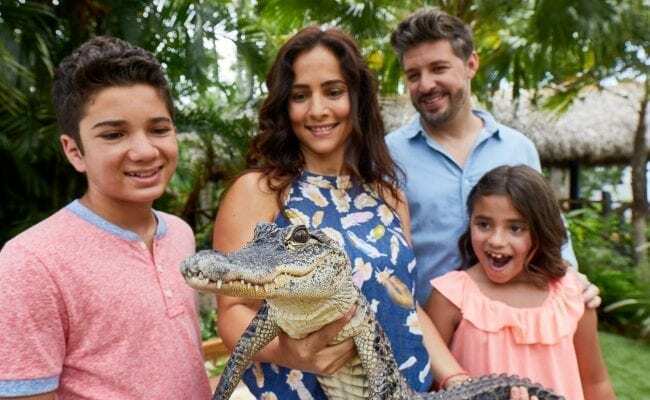 Be sure to take a few minutes to tour our beautiful tropical isle with lush foliage, exotic animals, and yummy soft serve ice cream at our gift shop. To confirm availability of cruises, please visit the book now page on this site or call our box office at 954-462-5596.